Thirty journalists, coders and designers took part in the fifth Hackastory event in South Africa last month, experimenting with bots, chat apps and browser extensions to make news more personalised or deliver stories differently online. The previous hackathon explored immersive formats such as 360 video and virtual reality, but this time, participants were free to pitch their own digital storytelling ideas. A big focus at the weekend-long event was personalised news on mobile. 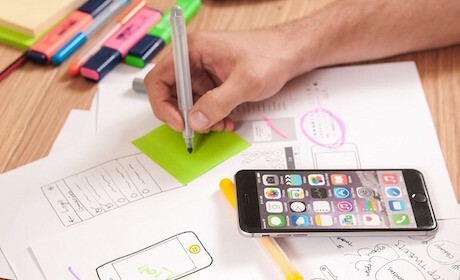 Albertine Piels, co-founder of Hackastory, said that while previous events had mostly desktop as the "main focal point", this event saw the majority of the five produced prototypes designed for mobile. "Usually, in the first hours of the event, we do a little game to get to know each other and we ask people what device or medium they consume news on the most," she told Journalism.co.uk. "This time, I think 90 per cent of the people said mobile. We also had a couple of people who said radio and two participants who said a physical newspaper." Attendees were mainly from South Africa, as well as Kenya and Sudan, and included journalists from digital news outlets such as The Daily Vox, the AmaBhungane Centre for Investigative Journalism, GroundUp and Code for South Africa. One of the groups decided to focus on the refugee crisis in Sudan. Their aim was to help the audience understand the stories of some of the three million people who have fled the country, and the impact this had on the region. They developed a prototype called 'Flight', a chat bot integrated with messaging app Telegram, where the user can individually carry a conversation with five fictional refugees to find out more about their experiences. Similarly to the newly launched Quartz iPhone app, the bot has pre-set interactivity options to choose from in order to move the conversation forward, and the messages also include videos and photos. For example, 13-year-old refugee Kuku might ask which is the best route to escape, sending screenshots of possible alternatives, and the user can recommend one of three locations by choosing from the on-screen options. "People are still trying to figure out what good way to talk about this topic is," Piels said. "This group thought it should be more personal, and chatting to people on your mobile phone is one of the most intimate experiences you can have. "So even if this is not a conversation with a real refugee, they tried to get that experience across." Personalisation was also explored in the 'Why should I care' prototype, developed with the idea that young audiences do care about the news, but only when they feel it is directly relevant to them. The team came up with the concept for a web app where the reader can tap, swipe and drag to interact with the story and unlock different elements of it as they go along. An article would be broken up into easily digestible nuggets of information, with the reader given a link at the end of each element to click through and read the full article, if they wish. "They give you, in a very explicit way, the reason why you should care about this story. "So hopefully with every step and interaction, you get an idea of what is important for you," said Piels. The prototype for the third project, 'I see dead people', started from the premise that death in different parts of the world is not treated and covered equally by the media. Often, they argued, it "portrays death in the global south much more graphically than in the global north". 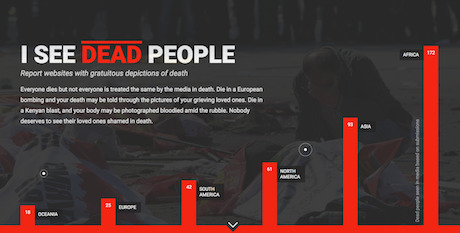 To address this issue, the team created a tool that allows readers to report or submit "gratuitous" images of death they see online. Vicarious trauma has become an important topic of discussion in most newsrooms, where journalists have to search for and verify an extensive amount of distressing eyewitness media on a daily basis. But it can equally affect readers who are bombarded with graphic images and autoplay videos on social media platforms. These are gathered into a public database, which features a body counter graph that shows the number of dead bodies represented in media reports and which continent they came from. The team continued to work on this project after Hackastory concluded, and people can now report any material they find inappropriate or offensive through their web browser or by dragging the bookmark tool available to an article. When a user provides a link to the story or website, the platform parses the URL and automatically extracts certain information from it, such as the name of the author, the relevant image and the number of bodies in it. The reader then has to fill in where the image was taken, and rate how gruesome they found it before submitting a report. Members of the team hoped the project can contribute to a greater discussion on how death is depicted in the media, and serve as a resource for content analysis and advocacy. Other prototypes to come out of Hackastory included 'Crowd control', a game that allows the user to take the role of a South African police officer for a day to experience what it's like to deal with protesters, and Hunger Ninja, a web tool that calculates the level of draught in South Africa and how it affects hunger in the region.